BFAMFAPhD makes Art, Reports and Teaching Tools to advocate for cultural equity in the United States. We bring people together to analyse and reimagine power relationships in the arts. BFAMFAPhD is a collective of artists, designers, technologists, organizers, and educators who work in the intersection of art, technology, and political economy. Concerned about the impact of debt, rent, and precarity on the lives of creative people, BFAMFAPhD asks: What is a work of art in the age of $120,000 art degrees? BFAMFAPhD creates reports, pedagogical tools, and movement syllabi, including Artists Report Back, Census Report, Statements and… in which nothing can be finally paid off. BFAMFAPhD’s work has been cited widely by mainstream and art-centric press and has been exhibited at The Museum of Art and Design, Cleveland Art Institute, and The Brooklyn Museum. Select residencies and presentations include Triangle Arts Association, Brooklyn, NY, workshops at the Brooklyn Museum, Creative Time Summit and international weeklong intensives in Sweden and Denmark. BFAMFAPhD Core Members are Susan Jahoda, Emilio Martinez-Poppe, Agnes Szanyi, Emily Tareila, Vicky Virgin, and Caroline Woolard. Contributors include Pasqualina Azzarello, Julian Boilen, Ann Chen, Dia Felix, Art Jones, Ben Lerchin, Alex Mallis, Blair Murphy, Kieran Startup, Mauricio Vargas, Lika Volkova, Jeff Warren, and Zipeng Zhu. As artists and art school graduates, we often find ourselves in conversations about the difficulties of continuing our practice as writers, authors, artists, actors, photographers, musicians, singers, producers, directors, performers, choreographers, dancers and entertainers. We struggle to support ourselves with jobs outside of the arts and we struggle to earn a living in the arts. Yet art school administrators and “creative class” reports assure us that arts graduates make a living in the arts. Loan officers insist that art students can afford art school tuition, repaying student loans over time by working in the arts. This is not our experience. We decided that it was time make our own report. Connecting our lived experiences to national trends, we wanted to know: What is the impact of rent, debt, and precarity on working artists and arts graduates nationally? How many of us are there? If we are not supporting ourselves as working artists, what jobs do we work? We looked at artists’ demographics, occupations, educational attainment, field of degree, and earnings as recorded by the Census Bureau’s 2012 American Community Survey (ACS). The ACS is the largest survey that collects data about artists, surveying roughly 1 out of every 100 persons in the nation. 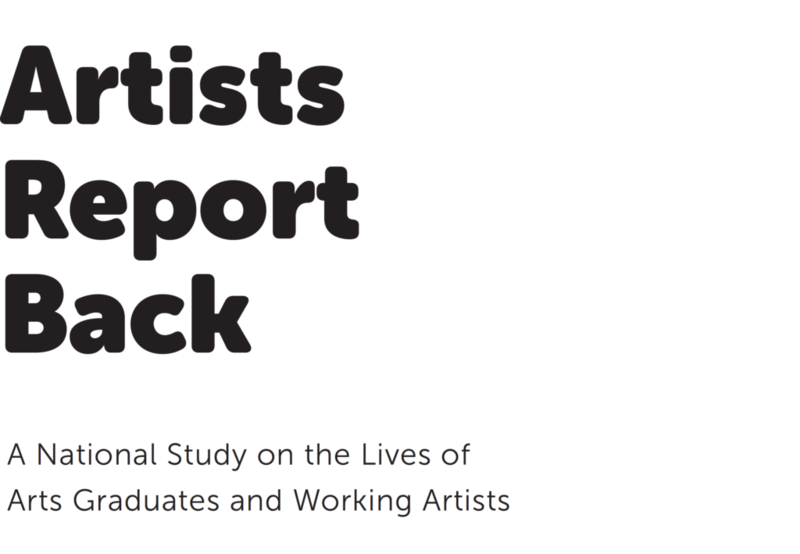 With this data in hand, we made this report to reframe conversations about the current conditions and contradictions of arts graduates, and to make informed decisions about the ways we live and work. At the end of the report, please see our recommendations for organizational change and interpersonal action. We see visual artists, creative writers, architects, and many people speaking up against rising debt, racial and gender inequity, and precarious labor in the arts. We are teaching that another way is possible – solidarity art worlds. We made Artists Report Back not as an argument of economic justification — it is a reflection on the conditions of cultural work in the United States today that paves the way for cultural equity initiatives locally and nationally. Making and Being: a Guide to Embodiment, Collaboration, and Circulation in the Visual Arts is a multi-platform pedagogical project which offers practices of contemplation, collaboration, and circulation in the visual arts. 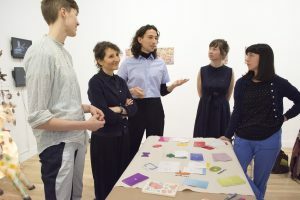 Making and Being is for arts educators who want to connect art to economy; for students who want to make artworks that reflect the conditions of their own production. Making and Being is a book, a series of videos, a deck of cards, and an interactive website with freely downloadable content. Making and Being: a Guide to Embodiment, Collaboration, and Circulation in the Visual Arts is a contribution to BFAMFAPhD from Susan Jahoda and Caroline Woolard with support from Fellow Emilio Martinez Poppe. Read the Introduction and the Spaces of Learning on Art21. A website with teaching tools, videos, and presentations to accompany Making and Being is coming soon. DOWNLOAD A DRAFT PDF with activities, assignments, text, and rubrics for embodiment, collaboration, and circulation in the visual arts, an excerpt from Making and Being. At Culture Push, New York. Caroline Woolard and Susan Jahoda of BFAMFAPhD, “Making and Being Card Game, created for Art Journal Open, Contemporary Projects, Pedagogies”, Art Journal Open, December 6, 2018. Léger, Marc James, “Neither Artist Nor Worker,” Esse, 94-Automne, 2018, p.21, 22. Reyes, Jen Delos, “Re-thinking Art Education (Revisited) Or How I learned to Love Art School Again,” Beyond Critique: Contemporary Art in Theory, Practice, and Instruction, eds., Pamela Fraser, Roger Rothman, New York: Bloomsbury Publishing, 2017, Part 3, Chapter 14, p. 171. Walker, Celeste, M, “BFAMFAPhD,” An Adjunct Professor’s Personal Experience with Student Debt Long After Leaving Graduate School,” The Neoliberal Agenda and the Student Debt Crisis in U.S. Higher Education, eds., Nicholas D. Hartlep, Lucille L.T. Eckrich, Brandon O. Hensley, New York: Routledge, 2017, Part 2 Chapter 6. Frenette, Alexandre and Steven J. Tepper, “What Difference Does it Make? Assessing the Effects of Arts-based Training on Career Pathways,” Higher Education and the Creative Economy, eds., Roberta Comunian, Abigail Gilmore, New York: Routledge, 2016. Chapter 5. 84-85. Satinsky, Abigail, “Movement Building for Beginners,” Art Journal, 74.3 (Fall 2015). 50-66. Berlatsky, Noah, “What Can You Really Do With a Degree in the Arts?,” The Atlantic, November 6, 2014. Guida, John, “If David Byrne Does Not Care About Contemporary Art, Should We?,” New York Times, October 29 2014. Ferdman, Roberto A., “If you’re lucky enough to earn a living from your art, you’re probably white,” The Washington Post, October 21, 2014. Schjeldahl, Peter, “Local Heroes: The Brooklyn Museum surveys recent art from the borough,” The New Yorker, October 20, 2014. BFAMFAPhD, Bad at Sports: 8 Podcasts on Making and Being at Hauser & Wirth, forthcoming in 2019. BFAMFAPhD, Bad at Sports: Live from Our Elevator Space at Open Engagement, Episode 629, 46 minutes, May 22, 2018. Thyrza Nichols Goodeve, “The Art of Institutional Possibility: CAROLINE WOOLARD with Thyrza Nichols Goodeve,” The Brooklyn Rail, LMAKgallery, February 7, 2018. Gretchen Coombs, “The Visible Hand at Cue Foundation,” Temporary Art Review, April 20, 2017. Alexis Clements, “How Art Making is a Type of Management,” Hyperallergic, February 6, 2017. Dimitris Lempesis, “ART CITIES:N.York-The Visible Hand ART VIEW,” Dreamideamachine, January 2017. Sullivan, Andrew, “It’s A Hard Smock Life,” The Dish, October 25 2014. Satinsky, Abigail, “Who Pays Artists?,” Bad at Sports, October 24, 2014. Brooks, Katherine, “Most Artists Who Make A Living From Their Work Are White, Research Says,” The Huffington Post, Arts and Culture, October 24, 2014.